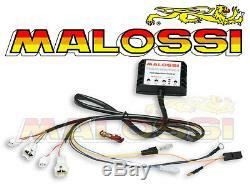 Electronic box malossi force master 2 new. For yamaha t-max 500 from 2004 to 2007. Force master 2 is the electronic box that allows to change the injection to fit perfectly the new 4t thermal group malossi. This box has been programmed with 4 different programs to be perfectly matched to your vehicle in any configuration. The curves were defined on the static power bench, simulating the effective load of the engine as if it were on the road. This allowed us to have a very fine carburation that can be compared to the original one! New, sold in original packaging. Suitable for yamaha t max 500 ie 4t lc from 2004 to 2007. ± 20% at min / medium / max. Speed ​​limiter moved at 9500 rpm. Curve 0: original double cylinder, original camshaft, malossi exhaust, malossi air filter. Curve 1: malossi pistons ø66, malossi camshaft, exhaust malossi, malossi air filter. Curve 2: Malossi double cylinder ø70, original camshaft, exhaust malossi, malossi air filter. Curve 3: malossi double cylinder ø70, malossi camshaft, exhaust malossi, malossi air filter. The item "Digitally Encrypted Digitronic Master 2 yamaha t-max tmax 500 2004 2007" is on sale since Thursday, March 14, 2013. It is in the category "auto, motorcycle parts, accessories \ motorcycle \ parts \ other". The seller is "motodak" and is located in st quentin. This item can be delivered anywhere in the world.